School classrooms are the ideal places for children to learn and practice good nutrition as they spend a large amount of their time in school and have one or two meals a day at school. Given this, not imparting nutrition education is a missed opportunity to empower children with better knowledge on nutrition and influence their dietary habits. In a recent survey conducted by the Kalanjiyam Trust (refer to article ‘Aspirations of rural students’ that appeared in Teacher Plus, September 09), a majority of the students from rural schools reported that their only role model was their teacher, indicating the power a teacher has to mould the children. Including nutrition education in schools is the need of the hour in a country where a large majority of children and adolescents are undernourished and have a number of nutritional deficiencies, such as iron, calcium and others that are vital for normal growth and development. .The National Family Health Survey (NFHS 3) conducted in all states in India (between 2005-06) provides a dismal picture of our children’s nutrition status. About 46% of the children under three years were underweight compared to the 47% reported in NFHS 2 conducted in 1998 -99. This indicates that nearly every second child is underweight, which is worse than in sub-Saharan Africa. 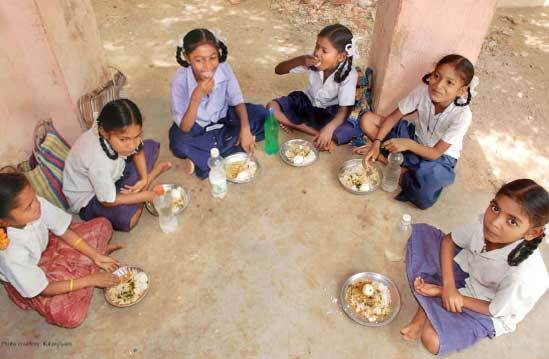 Added to this, 38% of the children were found to be stunted (not having adequate height for their age), a sign of prolonged undernourishment; and about 80% of the children were anemic, an increase from 74% in NFHS 2. This picture is sufficient to understand the nutritional profile of students who are starting their lives at a disadvantage, which has to be overcome through intense nutritional supplementation and proper balanced diet. Just as children need to understand the importance of good nutrition, teachers need reinforcement on how good nutrition contributes to a child’s cognitive abilities and ultimately his/her academic performance. A teacher might want to examine the differences between a student scoring high marks, one scoring mediocre marks and one who is a poor performer in the same class. Since the teacher does not take separate classes for good and poor students, it does not take long to realize that factors other than the teaching method are the major contributing factor of which a student’s health/nutritional status is among the foremost. A student’s current mental ability, IQ and mental health (which are directly related to school performance) are strongly linked to nutritional status, including that of the mother at the time of pregnancy, the child’s birth and early childhood, as well as his past and present dietary patterns. In fact, Science tells us that brain chemistry can change with the lack of even one nutrient and can give rise to diminished mental ability, emotional or behavioral disturbances, anxiety and many other disorders. One can then imagine the situation of children who routinely come to school without eating any breakfast, or who predominantly consume rice and do not get a balanced supply of essential vitamins in their diet. To be effective, a nutrition lesson needs to be provided in conjunction with a school breakfast and lunch programme that will help exemplify the lessons being taught to children. In schools where breakfast and noon meals are provided, teachers can talk about the nutrition value of foods being provided and its connection to health and performance. In public schools, teachers can, in conjunction with Anganwaadi workers, mobilize local resources to increase the amount of vegetables or pulses used in the noon meal, and introduce fruits or other nutritious snacks for children. Besides imparting information about nutrition and the links between diet, health and learning, teachers can focus on giving individual attention to developing skills among children in selecting foods and work with parents in preparation of foods. This is essential for children who are found to be physically weak and not doing well in class. Teachers can easily assess the dietary patterns of children who come from families that are primarily wage labourers, as the nutrition status of children from such families are likely to be more compromised. In such situations teachers can reinforce that a good nutritious diet is possible within the available means and help such children and their parents make healthier food choices using locally available options. Parents can channel the small amounts they give their children to purchase fast foods, junk or packaged foods, to rather include whole grains, milk or bananas. Using examples from health and nutrition in mathematics lessons. Providing nutrition tips or trivia and presenting a nutritional value every day in class. Checking with students randomly on what they ate for breakfast, and giving ‘stars’ to students who had breakfast and a balanced diet. Using stories, drama and role play activities during regular classes to help teach and reinforce the messages on nutrition and health. Including compositions / essay writing contests on health and nutrition. Presenting brief facts about the situation of our children’s nutrition in history or geography classes. Teachers can also advocate with the school administration to organize an annual health and nutrition day in their school, where special program or talks can be presented to children on nutrition, health and hygiene. While teachers face many challenges in bringing nutrition into the classroom, it is important to realize that they need to have an understanding of nutrition and have access to information sources to effectively impart nutrition education. This was in fact the overarching need expressed by teachers who participated in a programme organized by the Kalanjiyam Trust, to provide information on nutrition to rural teachers.This need triggered formation of a local Teacher’s Club, to serve as a resource and to support teachers in their efforts to integrate health and nutrition in school. In the upcoming months, Kalanjiyam will enroll teachers from the local schools and based on the needs expressed, organize informational and skill building workshops. Such a teacher’s club we expect will become a forum where teachers can share their experiences for effective cross learning. The important role of teachers in imparting knowledge on nutrition as well as instilling good dietary habits among children must be acknowledged and put to practice, given their power of influence over students. By talking about nutrition in the classroom teachers will more effectively be able to succeed in the ultimate aims of educating children and contribute to realizing the dream of healthier future generations of children in our country. It is never too early or too late to talk to children about nutrition. Children of all ages can be taught about basic nutritional requirements, the main food groups, types of foods in each group, the health benefits of each and how they can include these in their diet. Children in higher classes can be taught about the key nutrients for each food group, the recommended amounts to be had and about combination foods, those having multiple nutritious values. The food guide pyramid is a useful tool that teachers can use in the classroom to help explain to children what a good diet is and what kind of diet is right for them. 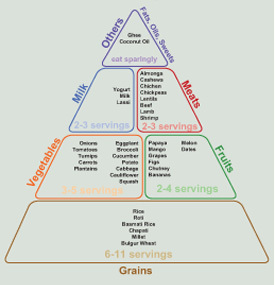 The name, food pyramid suggests that more servings are required of the foods at the bottom of the pyramid and fewer servings of those at the top to derive the necessary nutrition from them. Within each group it suggests varying serving sizes of food groups according to age, gender and activity levels. Eat foods from all five food groups every day as they are all equally important. Eat different foods from a food group every day even though they have the same nutrients, as the amounts of nutrients in each food vary, and therefore including different sources helps make a balanced diet. Make food choices that are nutritious but low in fat; while meat and poultry are important, low fat choices among this food group are best for long-term health. Never skip breakfast as it is the most important meal of the day. While talking to children about the other food groups, teachers should tell the children that limited amounts of “other” foods (fried foods, sweets, and other fast foods) are okay, as long as they don’t take the place of the more nutritious, first five-food-group food, and they balance their choices with plenty of daily physical activity. Teachers also need to address children’s likes and dislikes of foods so as to influence them adopt healthy eating habits. Along with this, encouraging personal cleanliness, good hygienic practices such as insisting that they always wear slippers outside their homes are important messages that children should receive in school. The author is founder and director, Kalanjiyam Trust, Chennai. He can be reached at kalanjiyam@gmail.com.